TAPit app update should be live by Monday. Includes an update for Answer Pad+ users: Paperless solution. 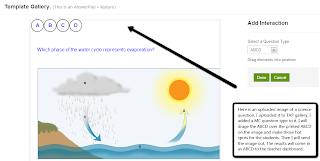 When you create an answer sheet, if the teacher uploads the pdf file to the library, when assigning the test, click the Display pdf box and the pdf will be displayed on the iPad app for a paperless solution. The paper test slides in on top of the answer sheet by clicking the pdf icon. The sheet can be dragged around, altered in size, with zooming for text size etc. It's pretty cool. We have this on the browser version, but we are going to be updating the browser version to be the same as the iPad app- it's much smoother. 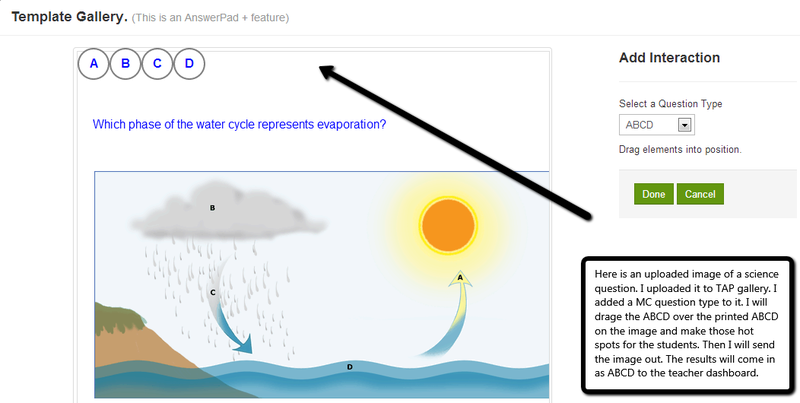 Also, on the teacher side, just released: Again for Answer Pad+ users: Take an image that you have uploaded in the the Go Interactive Template library, or just use one of ours- you can now add test to it ( eg, Type in a question), or add a drawing to it before sending it out. An example of this is the coordinate grid. The teacher could take the grid, draw a shape on it, send it out and ask the students to draw the reflection. In addition you can also take an image and add an interactive response type to it. So you could take a graphic and add ABCD to it, a slider or a fill in for eg. If you would like a brief demo on how to use Answer Pad w/ your class let me know!! !